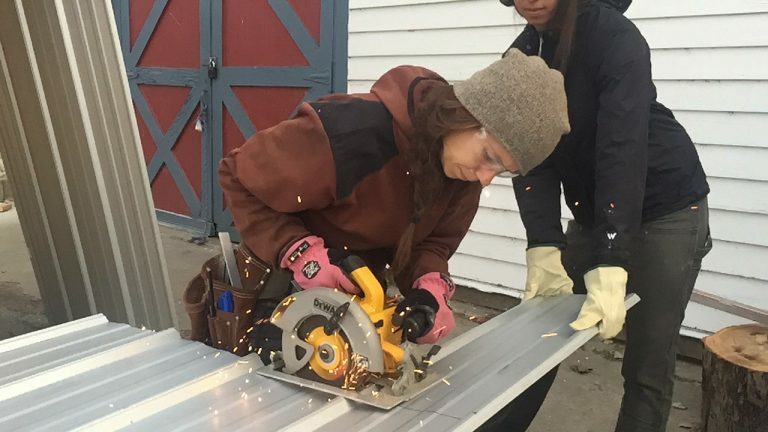 This eight-week intensive is held at the The South End Joinery, ReSOURCE’s wood shop on Pine Street in Burlington, Vermont. This program is designed to equip individuals with the skills necessary for entry level job readiness in carpentry and construction. 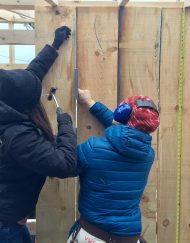 Students will learn the basics of carpentry by building a large, wood frame shed. Students will learn how to properly and safely use carpentry power and hand tools; proper carpentry vocabulary and job-site rules; process of building a house starting with building a floor, framing up walls, windows, doors, and roof, and finishing with sheathing the structure and installing the roof. Students will also receive introductory training in building science and home weatherization. Working together with ReSOURCE’s experienced employment counselors, students will develop a construction specific resumes, build job searching and job retention skills, and meet with a variety of local employers. For the final two weeks, participants will be placed in on-the-job- training placements with local employers that may lead to full-time employment. OSHA 10: Students will earn the OSHA-10 certificate for job site and construction safety – an essential certification for anyone entering the profession. NCCER Certificate of Introductory Craft Skills: (National Center for Construction Education and Research) NCCER develops standardized construction and maintenance curriculum and assessments with portable credentials. These credentials are tracked through NCCER’s Registry System, which allows organizations and companies to track the qualifications of their craft professionals and/or check the qualifications of possible new hires. NCCER’s Registry System also assists craft professionals by maintaining their records in a secure database. Most of Vermont’s largest employers in the construction industry will guarantee an interview and a higher starting wage to NCCER certified applicants.